Here we look at ways to locate contacts and addresses in the address book. As we add contacts to our address book, it becomes tedious to navigate the list with the Next and Previous buttons. A Find function would be more efficient. The screenshot above shows the Find button and its position on the panel of buttons. When the user clicks on the Find button, it is useful to display a dialog that prompts for a contact's name. Qt provides QDialog, which we subclass here to implement a FindDialog class. In order to subclass QDialog, we first include the header for QDialog in the finddialog.h file. Also, we use forward declaration to declare QLineEdit and QPushButton since we will be using those widgets in our dialog class. As in our AddressBook class, the FindDialog class includes the Q_OBJECT macro and its constructor is defined to accept a parent QWidget, even though the dialog will be opened as a separate window. We define a public function, getFindText(), to be used by classes that instantiate FindDialog. This function allows these classes to obtain the search string entered by the user. A public slot, findClicked(), is also defined to handle the search string when the user clicks the Find button. Lastly, we define the private variables, findButton, lineEdit and findText, corresponding to the Find button, the line edit into which the user types the search string, and an internal string used to store the search string for later use. Within the constructor of FindDialog, we set up the private variables, lineEdit, findButton and findText. We use a QHBoxLayout to position the widgets. We set the layout and window title, as well as connect the signals to their respective slots. Notice that findButton's clicked() signal is connected to findClicked() and accept(). The accept() slot provided by QDialog hides the dialog and sets the result code to Accepted. We use this function to help AddressBook's findContact() function know when the FindDialog object has been closed. We will explain this logic in further detail when discussing the findContact() function. In findClicked(), we validate lineEdit to ensure that the user did not click the Find button without entering a contact's name. Then, we set findText to the search string, extracted from lineEdit. After that, we clear the contents of lineEdit and hide the dialog. The findText variable has a public getter function, getFindText(), associated with it. Since we only ever set findText directly in both the constructor and in the findClicked() function, we do not create a setter function to accompany getFindText(). Because getFindText() is public, classes instantiating and using FindDialog can always access the search string that the user has entered and accepted. To ensure we can use FindDialog from within our AddressBook class, we include finddialog.h in the addressbook.h file. 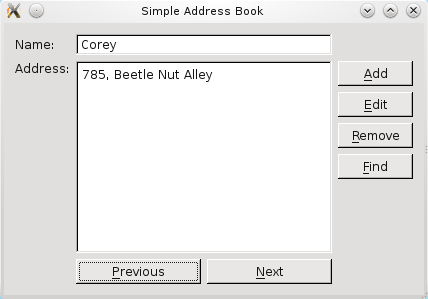 So far, all our address book features have a QPushButton and a corresponding slot. Similarly, for the Find feature we have findButton and findContact(). The findButton is declared as a private variable and the findContact() function is declared as a public slot. Lastly, we declare the private variable, dialog, which we will use to refer to an instance of FindDialog. Once we have instantiated a dialog, we will want to use it more than once; using a private variable allows us to refer to it from more than one place in the class. Next, we connect the findButton's clicked() signal to findContact(). We start out by displaying the FindDialog instance, dialog. This is when the user enters a contact name to look up. Once the user clicks the dialog's findButton, the dialog is hidden and the result code is set to QDialog::Accepted. This ensures that our if statement is always true. We then proceed to extract the search string, which in this case is contactName, using FindDialog's getFindText() function. If the contact exists in our address book, we display it immediately. Otherwise, we display the QMessageBox shown below to indicate that their search failed.